At the conclusion of the testing process, select products receive the Master Chefs’ Seal of Excellence. The Seal signifies that your product has been evaluated by credible, independent experts and has achieved the Master Chef standard of quality. In a crowded marketplace, the Seal lets prospects and customers know that your product is appraised by Certified Master Chefs® to be superior in its quality and application. When displayed on your product, packaging, and promotional materials, the Seal is a powerful, credible differentiator. Seal recipients also benefit from additional promotional and marketplace opportunities as a result of the Institute’s endorsement and extensive connections. 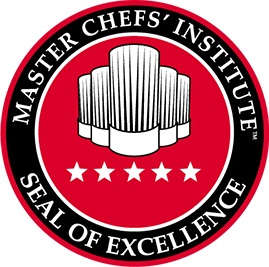 Certified Master Chefs have judged these products as having achieved the highest standards of quality, performance, and consistency. Discover how these brands use the Seal to enhance their brand awareness and marketing efforts.